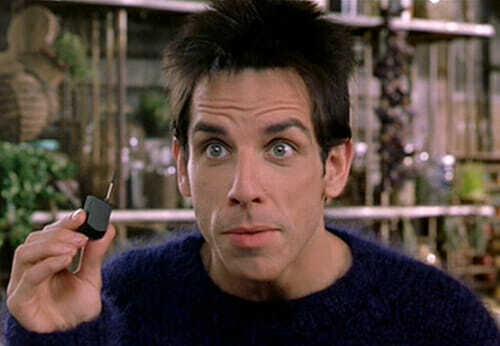 My kids and I were watching Zoolander the other day, and one joke I don't think they fully "got" was the ongoing gag where many of the characters had really tiny cell phones. The movie, made in 2001, was mocking a trend at the time where people were paying premium prices to get the smallest phone possible. It is amazing how things change. If you made that movie today, it would likely be written mocking the opposite effect, with people trying to talk on smart phones the size of salad plates. Here for example is a new 6.3 inch diagonal phone. Only NBA players who can palm a basketball need apply. Not to say there is anything illogical about this. We now read our phone much more than we listen to it. I am not sure either of my kids has ever made a phone call on their cell phones except to my wife and me. That second photo almost defines "smug git". I'm still a member of the 'keep the cell phone simple' set. I want a flip-phone (because it spans the ear-to-mouth distance) that keeps a list of calls and has an address book. That's it. to pretend my phone is a tablet. to surf the internet using a small phone screen. to read books on my phone. to take photos or videos with my phone. to play music or games with my phone. to text or write e-mails using number keys (ugh)! My ideal phone size is between the teeny one and the salad plate one. Smartphones have full keyboards--you don't type with your numeric keypad. Having said that, T-9 was a great advancement, and Swype, where you can draw a line connecting the letters of the word you want, is pretty awesome. I understand the lure of paper, but I like that I can store dozens of books on my phone. Unfortunately, audio books have not kept up with this change. We read many books from the library as audio. Most have WMA digital rights management (Microsoft) and will not play on any smartphone - only obsolete MP3 players. Naturally, since the library is a government institution, and the company that provides their audio book capability only gets money from governments, they are pretty clueless about this. Smart phones are not really phones.... if the early cell phones were prototypical Star Trek "communicators", I'd argue that the current crop of smart phones are actually prototype Star Trek TRICORDERS. Each of them has a few dozen sensors in them that can do all sorts of basic measuring, a computer capable of running specialized apps, and storage for the data they collect and/or process, along with some means of accessing "the ship's computer". This size increase thing is a temporary thing due to the need for a display -- there are a dozen or so varying techs which can potentially replace that, Google's "Glosses" are the primary front runner at the moment, of course. But even those are an issue, since they aren't where you are, 24/7/365. Something implanted is the next likely step , though that's likely to take some impressive engineering development. As usual, the whole issue is the currently incompetent Copyright system, which needed a major overhaul about 20 years ago. as a primer on the notion that copyright is wrong. Wait! Why were you watching "Zoolander"? Because it is a damn funny movie? I listen to 2-3 library books a month on my phone, both MP3s borrowed from Overdrive.com, and CDs that I borrow and transfer to my phone. Sometimes I buy an audiobook the library doesn't have. Of course, websites that sell audiobooks, as opposed to lend, have it in their interest to cater to as many devices as possible. With technology larger screened phones are also fitting in smaller form factors. My phone with 4.7" screen could easily support a 5.2" screen with modern edge to edge technology. 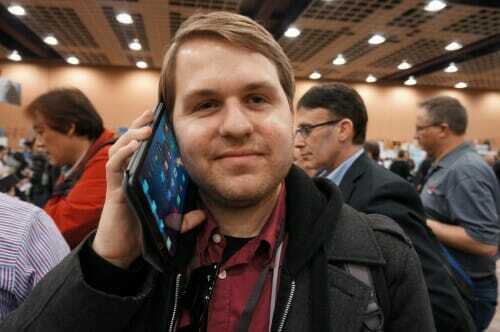 And this phone itself would only support 4" and be twice as thick two years ago. You are right about the sensors. Modern phones can detect barometric pressure, have a compass, GPS, proximity sensor, light sensors. Can detect wireless connections as well. In my pocket I also have a tool which can communicate in about a dozen ways as well and provide data for my computer. It is like the new Swiss army knife - which is good since folding knives are illegal in.schools now. I remember getting a pocket knife from my Grandpa when I was six. And the first thing I did was take it to school to. Show my friends. I was listening to the radio in Texas and heard a caller say he and his friends were able to take guns to school as well for after school hunting as long as they left the guns.by the teachers desk during the day. Today all the kids have are these amazing multifunction pocket computers masquerading as phones. I like how the mini phone still has an external antenna. I can read tomorrow's WSJ from my phone right now, and if I travel to Stinnett, Texas,or Liberal, Kansas (Hillary Clinton's birthplace), I can read it there, too, and not wait to buy it in the Wichita airport. I can read the Coyote blog in Venice, or at least ping it. I can get unwanted tweets from BHO anywhere in the world on Election Day, which is a differently flavored cow flop icing on a nice piece of cake. OK, even though I have no debt, my phone bills and cable bills are equal to a car loan for a Jaguar, only I do not get to drive a Jag. My question is, is Coyote worth not driving a nice car? Not to throw water on your parade, Warren, but you got me thinking about the Jim Bridger thing.